Did you know that the first bristle-type toothbrush was invented in China in 1498 and was made from hog hair? Fortunately for us, toothbrushes have come a long way since then! Today, in addition to what seems like hundreds of options for manual toothbrushes, we also have a wide variety of electric toothbrushes to choose from as well. While having choices is a good thing, it’s easy to feel overwhelmed when you’re in the market for an electric toothbrush. Since using the right hygiene tools is one of the best things you can do for your oral health, it’s well worth it to find out what a dentist recommends. Keep reading below to find out if electric toothbrushes are worth the extra money and whether there’s a difference between them! Does an Electric Toothbrush Really Do a Better Job? They provide 6,000 – 30,000 brush strokes per minute (depending on the model), which you simply can’t do with a manual brush. They stay on for the recommended amount of time (2 minutes). This automatically helps you brush more effectively. Electric options are especially helpful for anyone who has dexterity issues, such as arthritis in their hands. After using an electric brush, many people say that their teeth not only feel much cleaner, but also stay that way for longer. In other words, you won’t notice that “fuzzy” feeling as quickly. Some children can benefit greatly from an electric, especially if they’re in braces or have poor oral hygiene. Are There Significant Differences Between Models? 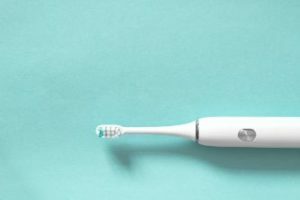 As with almost anything you buy today, there are models that range from very basic to those that have lots of “bells and whistles.” Electric toothbrushes are also available at every price point, so you can spend less than $50 or well over $100. Spend a little time researching the features available to see what might be helpful. Reading reviews is also a great way to learn more before making a purchase. What Should You Keep In Mind When Making a Decision? Regardless of what type of brush you’re using, the angle, pressure and overall technique are just as important. And, although an electric toothbrush will do a better job for most people, it’s still possible to do well with a manual brush. The best way to find out if you’re brushing well enough is to ask a dentist or hygienist at your next checkup. In addition to recommending the best toothbrush for your specific needs, they can also demonstrate the right technique. Toothbrush technology has come a long way since hog hair was used over 500 years ago. And, in the end, the best toothbrush is the one that you’ll use! With over 25 years of experience as a general dentist, Dr. Robert Long has seen firsthand how important good oral hygiene habits are. In addition to helping his patients choose high-quality products, he and his staff always take the time to educate people about good technique as well. If you have any other questions about oral hygiene products, he can be contacted via his website.